Remixed - Nekaro & Co. It's almost Friday!!! Three day school week as my kids were out on both Monday (professional development) and Tuesday (Election day). Bless it. We won't even start in on the politics, but let's just say I am disappointed in my state. Monday I drove my son to Elizabethtown for his orthodontist appointment. He wasn't looking forward to it because this visit meant they were putting on his bottom brackets and a pretty strong upper wire. One that was bad enough that the doc called it "The Monster". And it is. He hasn't been able to eat anything that requires chewing since then. Brings him to tears. He and Aleve have become BFF's. I made it one slipper into Kaia's Leethal Mary Janes. I DO NOT like this yarn. Maybe it's the particular pattern that I am trying to use it with, but it's hard for me to work with. So I moved on to doing Rowan's Be Loving, Remixed hat. 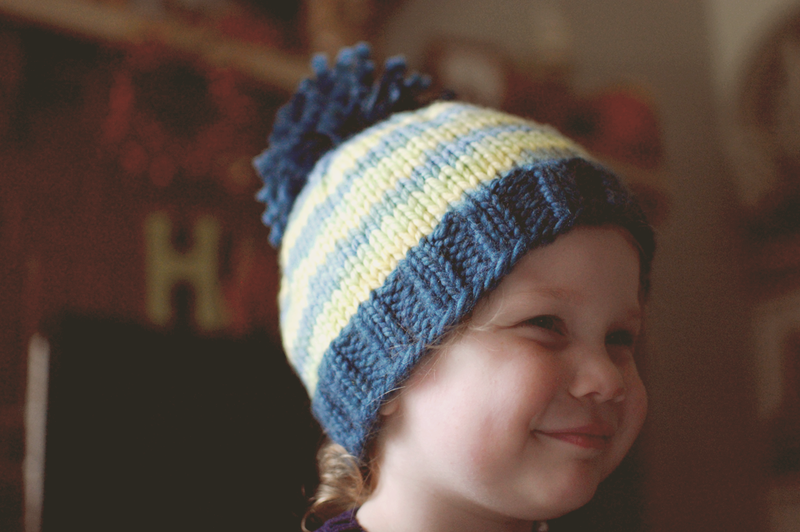 Easy, quick knit. I could have finished it in one day, but I stretched it out over two. It turned out awesome and she loves it. I thought it was going to be too big as I was knitting it, but nope, it's a perfect fit. This was supposed to be a Christmas stocking stuffer, but as soon as she caught a glimpse of the pom-pom, she was all *grabby hands*. Definitely could make many more of these! Your kids were out of school for election day? I didn't know people did that! We've always been out on election day around here. My polling place is actually at a school. I'm not exactly sure why though. I would think it would be a great teaching tool. Great job finishing a project! Adorbs. And I totally feel your son's pain! I remember the pain (and lack of, um, eating) that comes with braces. :-\ Bummery. And I, too, am grumbling, politically. Ours gave us a rock and a hard place, so I went third party. Bitter. Thanks! I was pleased with the way it turned out!